Going to the movies requires the larger part of an evening and it is not uncommon to rent movies spanning two DVDs. Fueled by this observation I explore data published by the Internet Movie Database to test the hypothesis that movies are getting longer. Leading to the conclusion that movies have had a constant length with a strong Mode length of 90 minutes. The search did come across some interesting outliers as well. The monstrosity The Cure for Insomnia from 1987 clocks in at three days and 15 hours and from 1970 The Longest Most Meaningless Movie in the World occupies the viewer with unintelligible gibberish for 48 hours. The statistics reveal something else. The data comes from www.imdb.com; "Earth's biggest movie database." Specifically it was obtained by downloading a text file of running times. The file was filtered to remove any movies made for television or which had running times not measured in minutes (up until the 1920's some movies were measured in feet). The output consists of 174,934 year and minute pairs. For details please the the shell script used for downloading and filtering . This output was read into matlab where all analysis and plotting was carried out.. 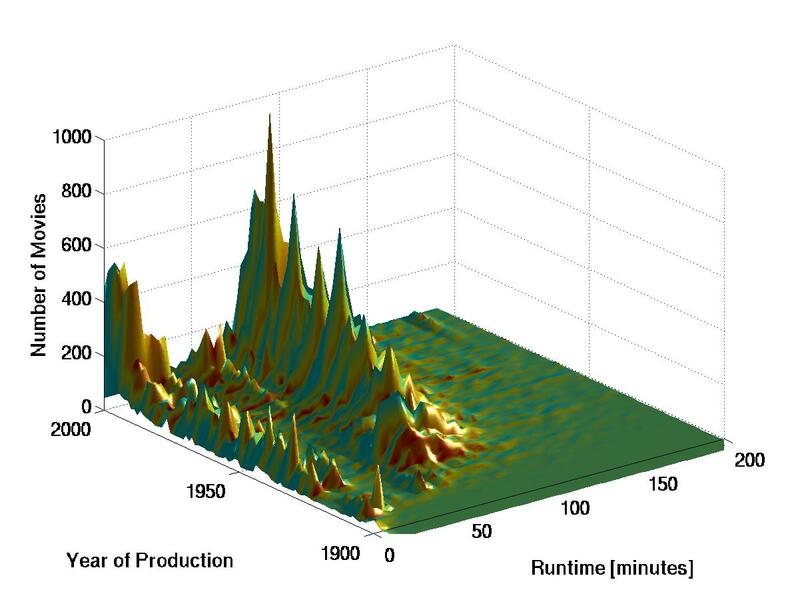 The most striking features appear when you look at a 3 dimensional histogram of the data where film length and year of production span the x and y axis. It is clearly obvious that there a two distinct categories of films: shorts and full length features. Where shorts generally run for 15 to 30 minutes and full length movies 60 to 180 minutes. It is also clear that the production rate is increasing with time. Not as a apparent and a little more surprising is the appearance of a new class of movies in the last 15 years - movies around 60 minutes. This could however be attributed to some made for television movies getting through the initial filter. In order not to skew the data I considered two ways of determining the average runtime. 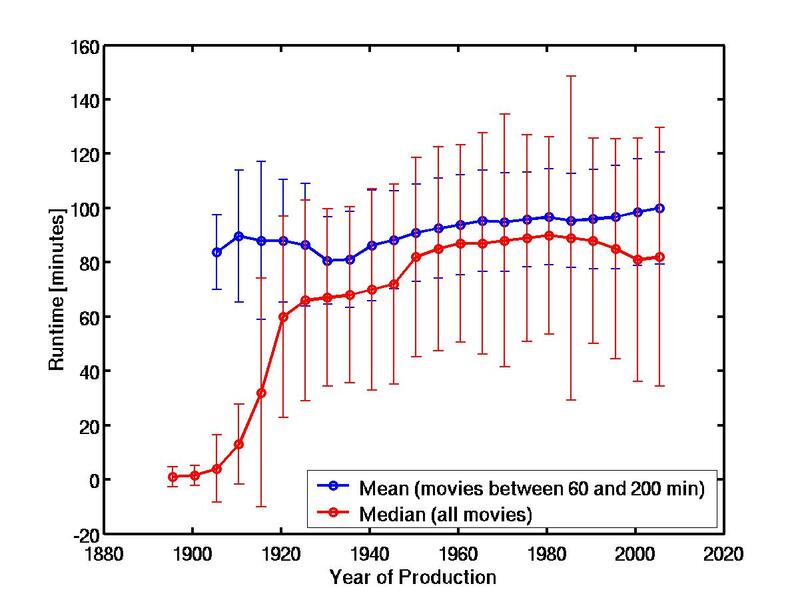 The median of all movies and the mean of movies in the full length category. These 116,861 movies are all movies between 60 minutes and 200 minutes. As can be seen in the second figure the time is constant within one standard deviation. With a slight, but statistically insignificant, difference between median and mean.